Flip Out Mama: CLOSED Jewelry Stylist Review & Giveaway! 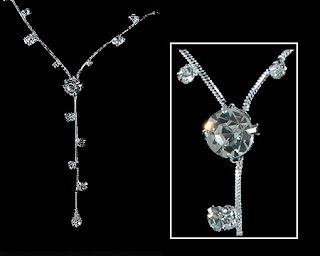 I recently had a chance to review this beautiful necklace from JewelryStylist.com. I don't wear jewelry much anymore, since I'm all sweatpantsy mommish nowadays, but I do love pretty things, and hopefully one day I will become a real girl again ( I feel like Pinocchio lol) and get to wear things like this on a regular basis. I aboslutely love this necklace! Ribbon necklaces have always been my favorite, and this amethyst one is no exception. Amethyst is my birthstone and I usually don't like it, but this one is a little more pinkish than most, and I really like that. Sigh. I could keep posting pictures of these beautiful things all night long, but I think I am just going to give you a chance to win some instead! The little pumpkins at Jewelry Stylist are offering the chance for one lucky Flip Out Mama reader to win a beautiful Amethyst Ribbon Necklace just like the one I received! 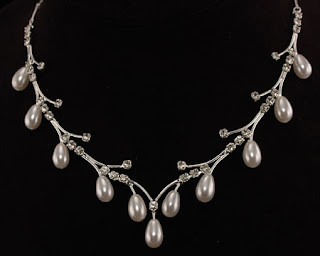 Mandatory Entry: Visit the fine folks over at Jewelry Stylist . Come back here and leave a comment telling me your favorite piece of jewelry . Extra Entry: Join Jewelry Stylist on facebook here. Comment and let me know you did. Extra Entry: Follow Jewelry Stylist on Twitter by clicking here. Comment and let me know you did. the Amethyst crystal dangle earrings in purple is pretty. The lime green, light citrus lime & white 8mm pearl necklace is calling my name. I love colored pearls! I've also entered the Roadkill Tee shirts giveaway. I love amethyst! It's my birth stone :) It's also my grandma's! 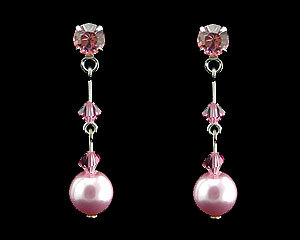 My favorite is the Pink Crystal and Silver Earring with Tear Drop. 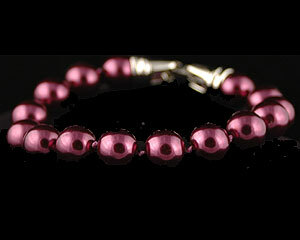 I like the Pink and Ivory Pearls on Silver Stretch Bracelet. I give my two thumbs up to the Citrine Yellow Crystal Drop Earrings with Dark Chain. The Light Blue and Rhinestone V drop Necklace would look great with a prom dress! I like the silver flower fantasy necklace with rhinestones. I follow Jewelry Stylist on twitter @Aerated. I follow them on twitter as @luckysluna. I entered your Road Kill t-shirts giveaway. I love the Multi-Strand Pink Pearl Bracelet with Ribbon and Crystals. Liked the: Clear Crystal Octagons on Silver Y - Necklace. 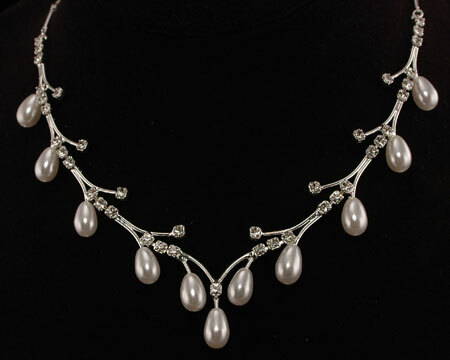 The Designer style White Pearl Necklace is my fave. My favorite piece is the Lavender Crystal & Silver Leaf Necklace for Bridesmaids (purple). I like the Silver and Crystal Cross Earring. I entered your classic snack gift basket giveaway. I love the Blue crystal dangle earrings. The Silver and Crystal Queen Tiara is beautiful. I follow jewelry stylist on twitter as kmayans. 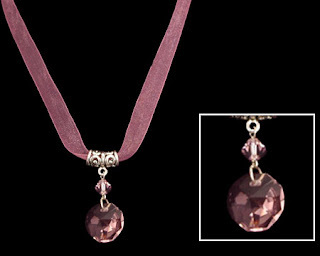 I like the Pink Leaf and Tear Drop Silver Flower Necklace. I love the Baby Blue Austrian Crystal Flower Hair Jewel - Spiral. I entered your Stride Everyday Giveaway. I like the garnet crystal dangle earrings. Like you, I adore ribbon necklaces and lucky me, we have a fabulous Fabric & Notions Warehouse Store a few blcks away that sells beautiful ribbons in all kinds of colors, widths, styles, etc. So I can make my own "chains" bows, etc. I love the Champagne Pearl Stretch Bracelet with Gold Accent and Strands, thanks! I love the Multi Strand White Pearl and Crystal Bridal Cross.